Isobaric Tag for Relative Absolute Quantitation (iTRAQ) and Tandem Mass Tags (TMT) are two similar quantitative proteomic techniques developed by AB SCIEX and Thermo Fisher, respectively. The most distinctive advantage of these two techniques is that they can label up to 10 different samples and compare the relative proteomic change through LC-MS/MS analysis. Therefore, these techniques are widely applied to study proteomic changes under different treatments or in different development stages. MtoZ Biolabs is proud to offer iTRAQ/TMT analysis service to meet your research needs. On the basis of these two well-established techniques, we can also provide MultiNotch MS analysis service through MS3 or proton-transfer reactions (PTR) to further increase the accuracy of the proteomic quantitation. MtoZ Biolabs has developed a specialized platform, equipped with Q Exactive HF (Thermo Fisher), Orbitrap Fusion, Orbitrap Fusion Lumos mass spectrometers coupled with Nano-LC for iTRAQ/TMT analysis service. To better solve your research problems, we offer an all-inclusive service, including protein reduction and digestion, peptide labeling, LC-MS/MS analysis, MS data analysis and bioinformatics analysis. All you need to do is to tell us your project objective, and send us your protein samples, and we will complete all the following experiments. The iTRAQ/TMT isobaric tags are similar and generally consist of three parts, reporter group, balance group, and reactive group. Peptides are labeled with isobaric tags by reacting with the reactive group. 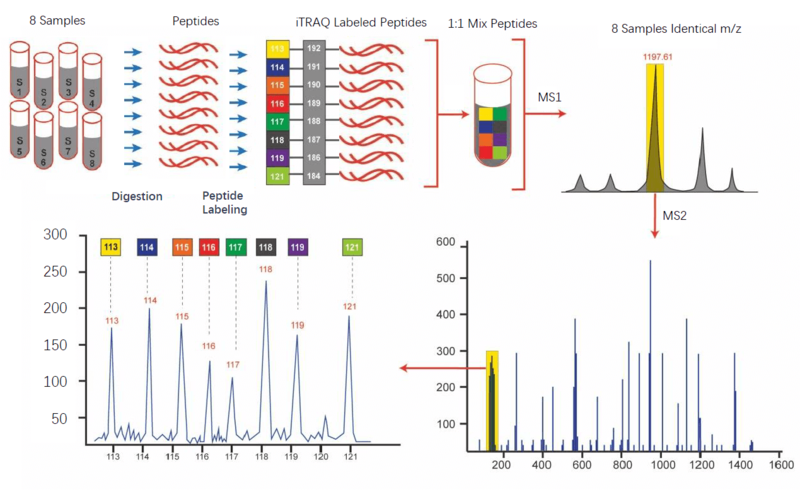 In MS spectrum, different iTRAQ-tag labeled peptides have the same mass, and thus appear in the same MS peaks. However, when fragmented in MS/MS, the reporter group dissociates to produce ion signals, which provide quantitative information regarding the relative amount of the peptide in the samples. •	In vitro labeling: compatible for labeling various samples, including tissue, cell, blood, etc.